Modern original art by brian m jones. "Rhythmic Curves" 2016 United States. (1 Piece) Approximately 28" Long x 6" Wide x 2 Deep. Artwork consists of a beautiful hand sanded & painted aluminum "curve" panel mounted on a natural aluminum curved base, with textured deep gray ribbon accents. Brian M Jones - Cincinnati, Ohio. Wall Sculpture Comes Ready to Hang Vertically. Yes - Custom Paint - A stunning mixture of hand painted jewel tones! Yes - UV and scratch resistant clearcoat is applied. See below for frequently asked questions. How will I know when my order ships? How Many Art Pieces are Included? Photos may include zoomed in views or multiple angles of the same piece. Are bright lights needed to view the artwork? In general, bright lighting is ideal. We recommend a track type lighting system to optimize the display of your artwork, however this is optional and is truly a matter of preference. Natural daylight through a nearby window also looks great during the day! One of the reasons aluminum is utilized is because it is so light weight! Larger pieces will only weigh about 8-10 pounds! What type of surface does the artwork have? The original metal surface is grinded, sanded, polished and sometimes even painted as well! 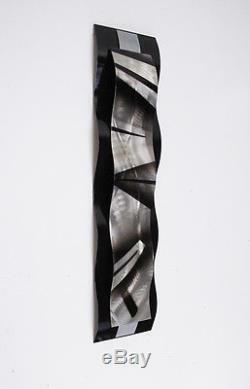 One of the most desired styles today, contemporary-abstract metal artwork has steadily grown in popularity. Meshing perfectly with modern contemporary architecture and interior decor, along with its unique visual appeal, has made it a top choice for professional interior designers around the world. Natural elements (metals, stones, and woods) can help create an instinctually calming and harmonic feeling in ones living space. The glowing effect of this particular type of metal (aluminum alloy) develops a warm, relaxing, atmosphere. With natural sunlight during the day, and track lighting in the evening this artwork will showcase a dazzling movement and reflection of light every time you pass by! Seeing this artwork in person is truly the only way to fully appreciate its beauty. Hello and Thank You for viewing my work! Aluminum has an unparalleled ability to absorb and glow with the light around it, an amazing sight. Careful sanding and polishing creates deep, flowing, textures that capture and reflect the surrounding light and create subtle movements! I also cover the entire artwork with a beautiful clear coat for UV and scratch protection, and to add luster for stunning visual effects! Thank You for supporting independent artists, and your great feedback! 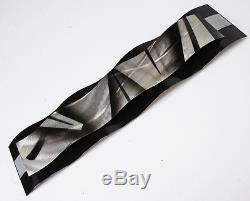 We use only top quality packaging materials to protect your artwork. 200 pound test boxes, polyethylene foam lining, and custom heavy plastic inserts. 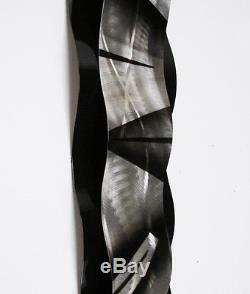 We sell artwork made by a real artist, in the USA! If you ask to speak with the artist, you will have direct contact with the actual artist. Working with materials from canvas to fiberglass, metals and woods, his diverse experience with raw materials allows him to add unique style and technique to each piece he does. Educated at The Savannah College of Art & Design (SCAD), he fine tuned his creative talent, and has now been creating work for over twenty years. With an eye for electrifying color, and high energy designs his work is sure to add some serious kick to your living space! 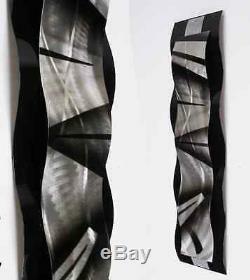 The item "Modern Abstract Metal Wall Sculpture Art Black & Silver Painting Home Decor New" is in sale since Monday, June 11, 2012. This item is in the category "Art\Paintings".